It’s bad enough that I’ve had to spend the last 10 years enduring LOL Cats and other images of pets doing crazy things, now there seems to be a trend to post photos of pets sleeping. THEY’RE NOT EVEN DOING ANYTHING! I hate facebook. The kids have been introduced to Star Wars and of course they love it. But the way they show it is very different. Marcus found himself obsessed with the how and why of the film, why did Vader do this, why did Luke do that, how did they make this effect etc. etc. He threw himself into making Lego models of things he saw, both kits and simple replication of things with random Legos. 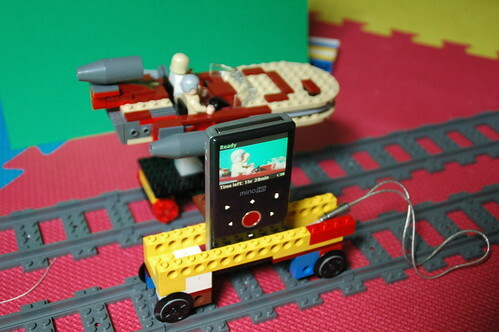 Since we’ve been doing stop motion animation projects, he would use his Lego characters to make movies, all it required was taking digital photos and most of his movies had to do with recreating effects with the characters. This led me to believe that he would enjoy the Making of Star Wars. And since we also watched Back to the Future recently, I had them watch the making of Back to the Future and Star Wars. 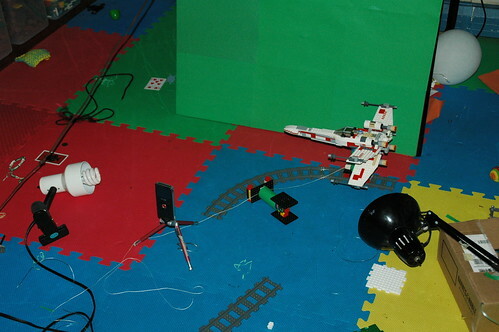 Suddenly cars were disappearing and reappearing in his movies, and his room because something of an effects studio, complete with green screen, lights, and a track mounted camera that is fixed to the track mounted speeder for consistent framing in motion. He’s eight. Jared on the other hand, loves pretending to be characters whether it’s with toy figures, dressing up, or just pretending to be the characters. He made me make his light saber look and sound real.